The AD510 scanner is a great upgrade from the more basic diagnostic scan tool. 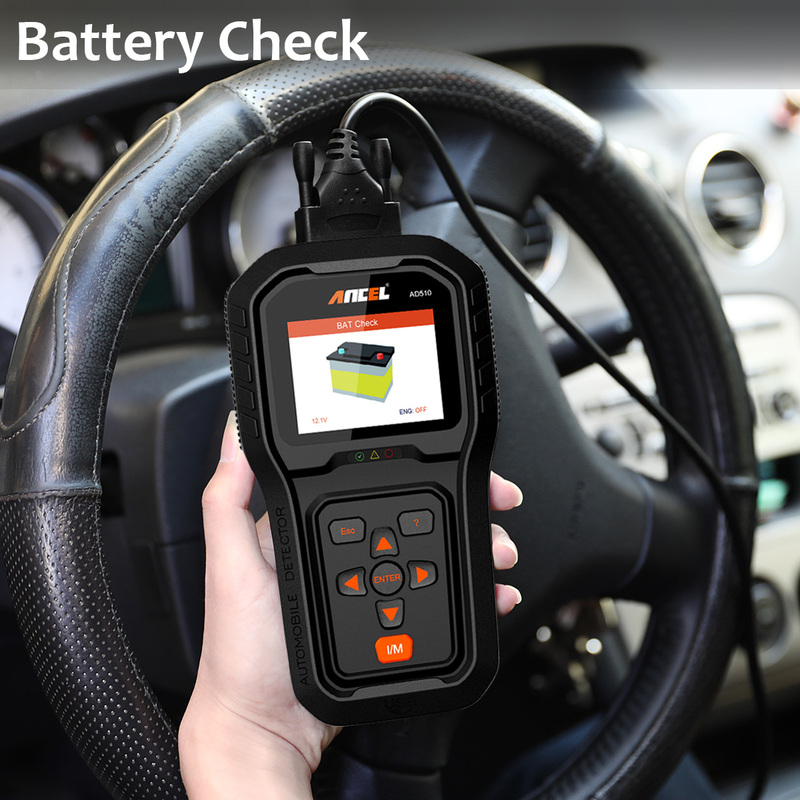 It supports battery monitoring check, displays battery real-time voltage info, safety protected the car battery from over-voltage, you know ahead of your car battery status. 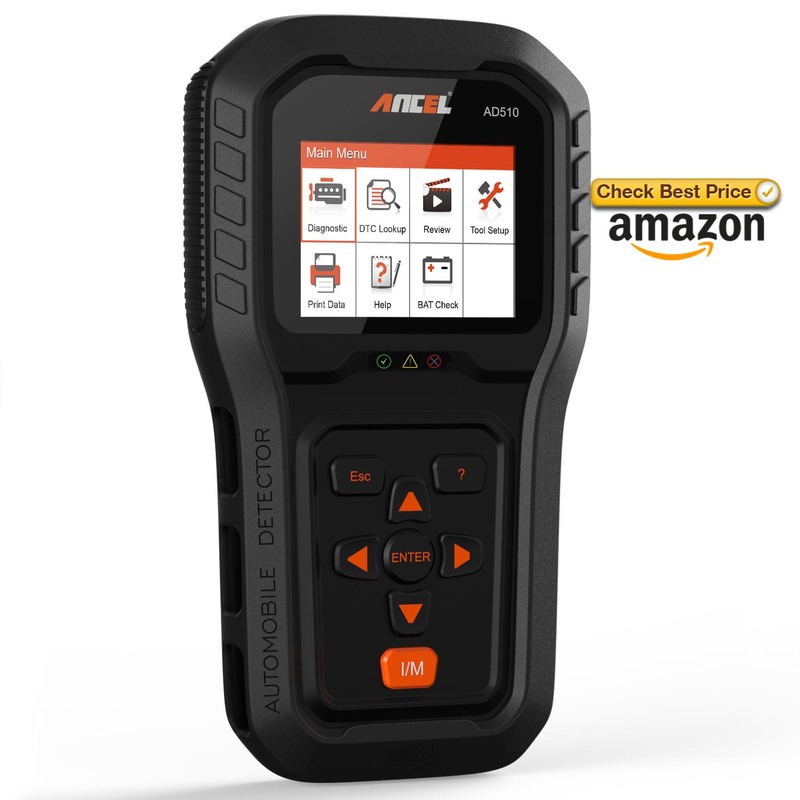 The ANCEL AD510 scanner supports all 10 OBD test modes on all OBDII compliant vehicles.it can works on all OBDII protocols: KW2000, ISO9141, J1850VPW, J1850PWM and CAN. 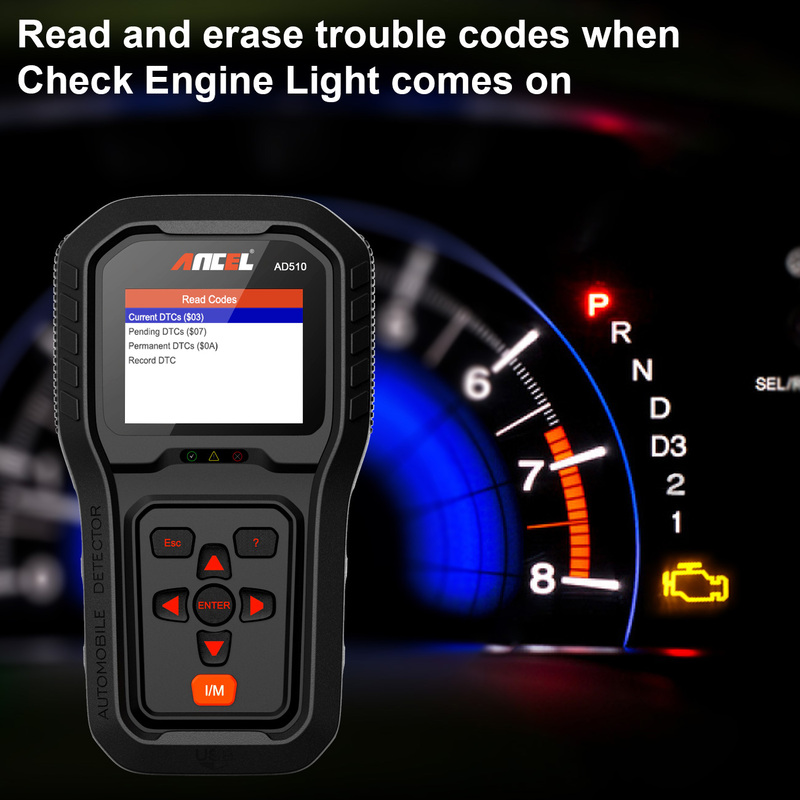 It can read and clear codes, graphing data stream, turn off check engine light (MIL), DTC look-up, O2 sensor test, EVAP system test, battery monitoring, print data report, I/M readiness, free upgrade online and more. These let you can fully know your vehicles powertrain system running status at anytime. AD510 scanner is a great upgrade from the more basic diagnostic scan tool. It supports battery monitoring check, displays battery real-time voltage info, you know ahead of your car Powertrain & Battery status. 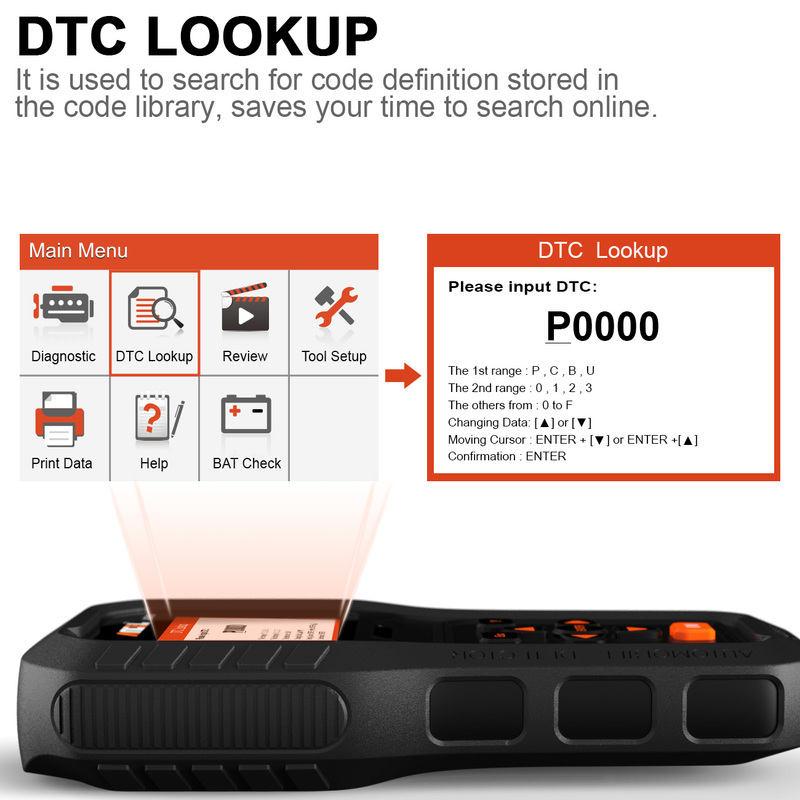 4.Built-in OBD2 fault code DTC look-up library, east to know what is error meaning. 7.Battery voltage monitoring in real time. 8.Retrieves vehicle information (VIN, CIN and CVN). 10.Print and free upgrade online. Works on most Domestic cars from 1996-present and imported, Support all 12V Gasoline and Diesel engine cars. Can’t support 24V heavy duty trucks. Q1:Does ancel ad510 work on diesel Vehicles? A1:Yes, it supports all 12V vehicles, both gasoline and diesel. Q2:Does Ancel AD510 work with BOTH, American and foreign cars like Japanese and German vehicles? A2:Yes, it supports full OBDII protocols and it works for European cars from 2001, Asian from 2005, and domestic from 1996 to present. Q3:Will engine code readers read the data of car oxygen sensor? Does it have evap test ? A3:Yes, it supports O2 sensor and Evap test for most cars on the market. But Not for all. PLEASE confirm with us BEFORE purchase. Q4:Would this work with a Volvo S80 manual petrol? Can this be connected to a Windows PC? How can I update it? A4:Yes, It works with Volvo S80. It can be connected with Win7, Win8, Win10 and XP PC. But please note that it’s incompatible with MAC. Go to the ANCEL website and download the AncelScanner Installer.zip software for updates. Q5:Does it come with cable? What’s inside the package? A5:Yes, it comes with a 5ft long cable. Package includes: Main unit with shockproof case, USB cable, 5ft long cable, user’s manual and portable carry case. This is a handy OBD II reader for cars which supports major protocols such as KW2000, ISO9141, J1850VPW, J1850PWM and CAN (these should cover most newer cars on market). 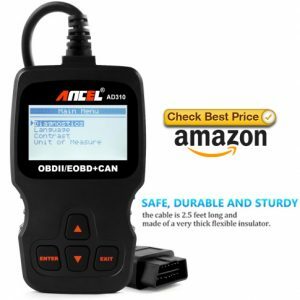 It comes with OBD II cable and the device is powered through it. There is a USB port near the bottom of the device for data export if needed. The unit works well with my MDX and I can get all the readings I need. The large colorful screen makes it easy to navigate through tasks and check results. It has a built-in error code database for quicker look up of problems. It supports both read and “CLEAR” codes. What I like most is that it has a “battery check” feature so I can get battery reading right away instead of trying to hook up a battery tester onto my car battery.